I took these photos yesterday evening in our neighborhood. 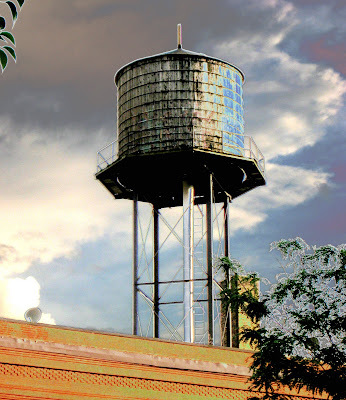 I have been enjoying taking photos and messing around with the editing in Photoshop. There is so much to learn. Both my kids are really good at using Photoshop and so I often consult them on how to do things. Yesterday I had each of them take this photo and do what ever they wanted with it in Photoshop. I love how each of them worked with the image, Nina concentrated on working with the color and Ty made it look like an illustration. 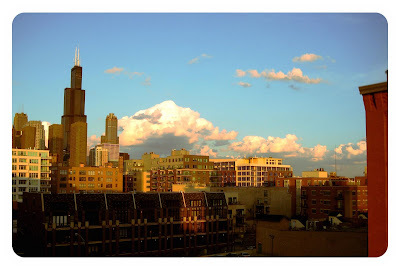 I took this photo from our window close to sunset. I love the light quality when the sky is dark and cloudy and the sun is breaking through. Everything seems to glow. 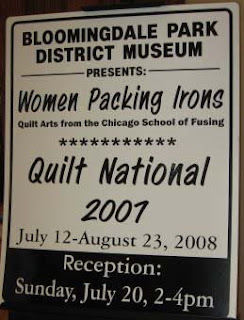 Today the Chicago School of Fusing hung a show at the Bloomingdale Park District Museum that will coincide with an exhibit from Quilt National. 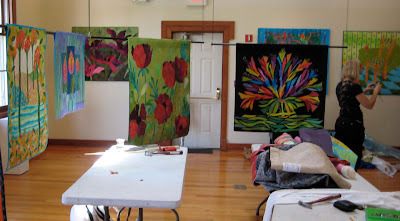 It was a fun morning with lots of laughter, gorgeous quilts and flying hammers. Followed by lunch chatting about blogging, teaching and traveling in this new economy where airlines are unstable and charging extra for baggage. Imagine how much harder it is for busy traveling teachers who fly with several bags that tip the scales getting to their venues when airlines are also canceling flights. 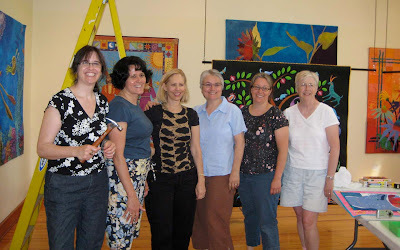 From left to right, next to me is Anne Lullie, Frieda Anderson, Laura Wasilowski, Emily Parson and Anne Fahl. 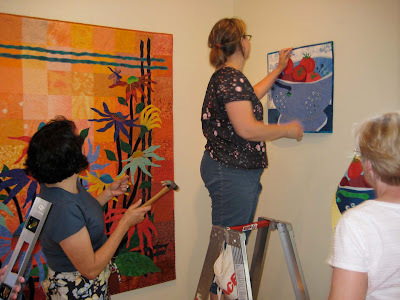 The hammer came in handy, I only had to threaten them a little to let me hang my quilts with theirs. It's a lovely exhibit. If you are in the area July 20th stop by the reception, it would be nice to say hi. My husbands Ad "Muffin top" for Lifesavers won a Bronze Lion at Cannes! Click on the photo on the Cannes Lions website to play the clip for the ad. When my son was little he adored bugs. For him, moving to Texas was like taking up residence in an exotic zoo. Every day there was an encounter with something new to put in his bug box and study. There is so much variety in the shapes, colors and textures that insects come in, I admit to being fascinated too. 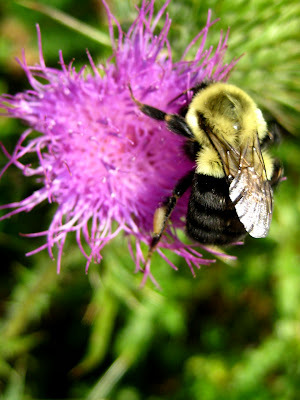 This bee looks so velvety and soft, I want to pet it. I love the metallic jewel like sheen of beetles. 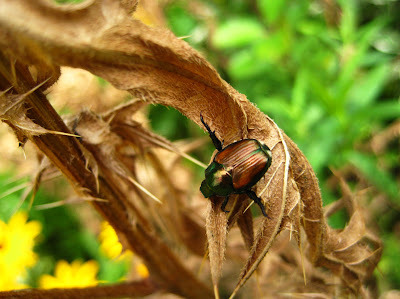 One Christmas, I gave my little sister a gorgeous colorful beetle carapace that had been turned into a pin. I thought it was a cool and original gift. Evidently she did not have the same appreciation and was slightly repulsed, lol. I would have worn it. It just shows, beauty is in the eye of the beholder. Saturday Sunday We had buckets of rain come down a couple times today. 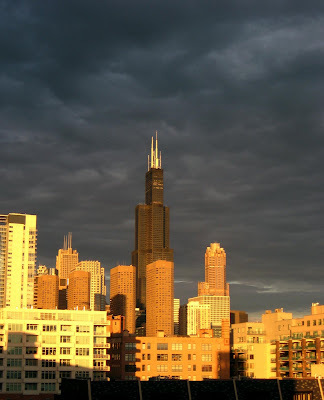 The second time the clouds opened up while the sun was still shining in the late afternoon. 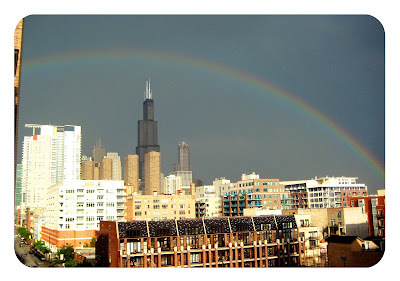 When it stopped there was a great big rainbow in the dark sky right over the Sears Tower. 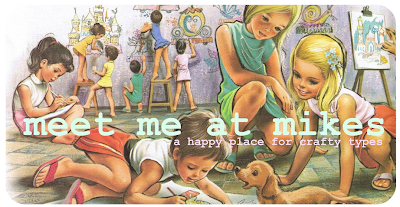 Today I came across a fun Aussie blog Meet Me at Mikes for crafters, lots of good stuff to see here! For long time bloggers and new bloggers there are always questions about it. Pip has written a great series of posts on blogging from creating a blog to blogging etiquette, excellent advice, check it out. 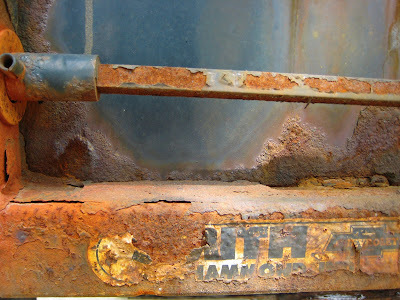 This was the back end of a truck parked in the neighborhood. 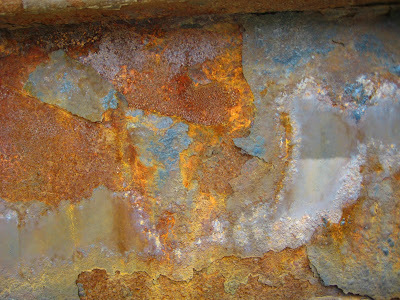 Gorgeous color palette, I love the bubbly texture and layers of chipped metal. 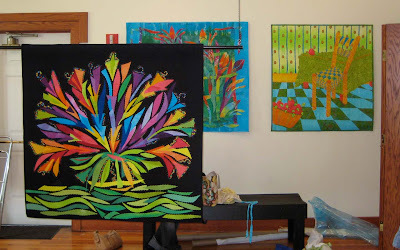 My new blog Painted Threads Projects will be an archive for projects originally posted here on Painted Threads. It is a place to go to see step out photos with descriptions on various projects that I have done. 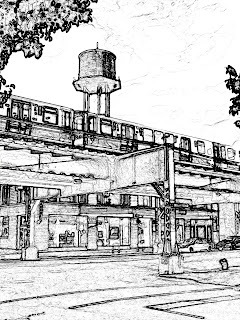 These are blog posts that have been consolidated by project, including comments with questions and answers relating to each project originally posted here. 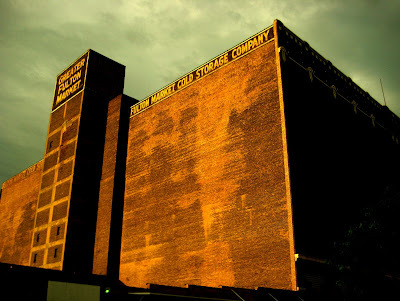 I know how hard it can be to find things in a 4 year archive and if you are new to my blog there may be many things you have never seen. There are still a few projects left to be added, but they are almost all there. 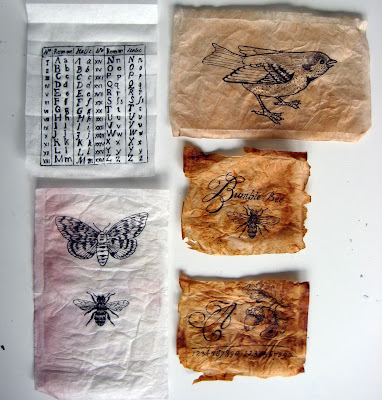 Painted Threads Projects will not be updated as often as this blog, I have set it up mostly to be like a reference book. 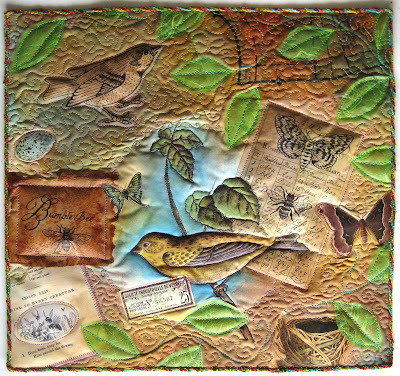 Many of you pre-ordered my Mixed Media Painted Fabric workshop DVD from Quilting Arts and received it this week. Thank you! Evidently there was a mix up in production and the DVD was mislabeled. 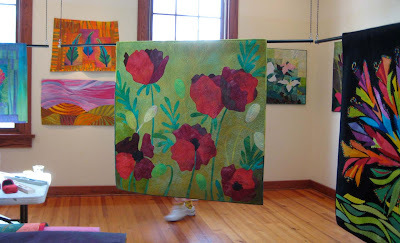 So if you watched it and it wasn't what you were expecting, it is because the DVD that you received was the Painting Fabric for Whole Cloth Quilts workshop with the Mixed Media Painted Fabric label and packaging. Quilting Arts will be contacting you about resolving this, for now new orders have been put on hold. Lovely evening for a naked bike ride through the city. 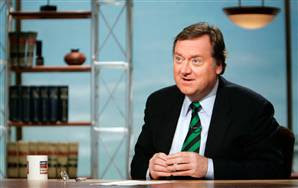 I am shocked and so sad that we have lost Tim Russert. Sunday mornings will never be the same. My ritual is to make a cup of tea, pull out the knitting while everyone else in the house is still asleep and watch Meet the Press. This is such a huge loss for all of us who love political commentary, insight and analysis, great interviews with politicians asking the tough questions. This has been an especially exciting year in politics and Tim Russert has made it so much better, so clearly unbiased and intelligent he brought so much to political journalism. This is all so sad. He will be greatly missed. Often while I work I listen to audio books. I am able to get through so many more books than I would if I tried to read them all. This is multitasking of the best kind. 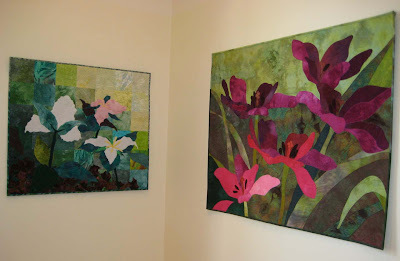 I think painting or quilting must engage a different part of my brain than listening to books, making both activites completely enjoyable at the same time. Often I like loosing myself in fiction while I work, but these books have been on my reading list for some time and each of them have been fascinating. This is the amazing autobiography of a woman born into a family of desert nomads in Somalia. She spent her childhood moving from country to country as a political refugee. Circumcised when she was a girl, educated by Muslim imams in Kenya and Saudi Arabia and forced into an arranged marriage with a stranger from Canada, she ultimately ran away to Holland while in transit to her new husband. As a refugee there, she attended college and eventually became a member of Parliament. Ayaan has spent her adult life trying to bring awareness to the enslavement, abuse and murder of women in Islamic society that exists even here in the west. She believes the most fanatical interpretations of Islam, create "a culture that generates more backwardness with every generation." Because of her outspokenness, she has lived with death threats for years. You may remember a few years ago when the film maker Theo VanGogh was brutally murdered in broad daylight after making a short film with her. Another thing that she talks about in the book is the tribal, bigoted, clan culture of the Mideast. This really makes you think about how futile the US role in Iraq is. These groups hate each other, but hate us more, it would be impossible for the US to bring peace to this area. It is naive and elitist thinking on the part of our government to think they can resolves this. After 9/11 she said, “I found myself thinking that the Quran is not a holy document. It is a historical record, written by humans. . . . And it is a very tribal and Arab version of events. It spreads a culture that is brutal, bigoted, fixated on controlling women, and harsh in war." I have always been fairly open minded about Islamic religion, believing that the fundamentalist thinking of the terrorists behind 9/11 and other tragic events were extremist thinking. Evidently the passionate hatred of the west reaches far beyond Al Qaida. This story was first mentioned in Freakonomics. 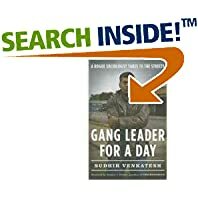 Gang Leader for a Day is a fascinating inside look at a Chicago crack-dealing gang by, Columbia University professor Sudhir Venkatesh. 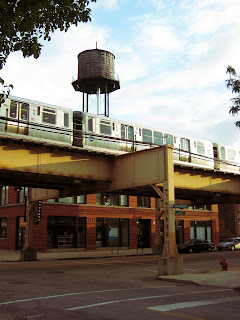 As a first-year doctoral student at the University of Chicago, Venkatesh's first interaction with the Black Kings was when he was sent to the projects with a multiple-choice questionnaire on poverty. After being held hostage over night in a stairwell, Venkatesh had the guts to return to the projects a day later to talk to these young men again, without the clipboard. 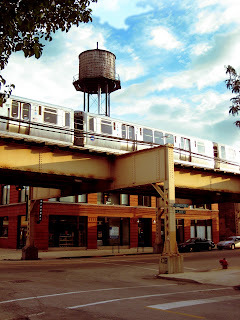 Eventually he was accepted by the gang leader, a college educated man who found himself unfairly passed over for promotions in the corporate world and chose to return to the Robert Taylor projects on the south side of Chicago. Vantakesh spent 7 years getting to know the neighborhood dealers, crackheads, prostitutes, pimps, squatters, activists, police, and officials. He was able to observe the gang as they operated their crack-selling business and learned the gang's complex organizational structure comparing it to many top corporations in this country. I just saw a commercial for the "Oprah meets her neighbors" episode taped last May (2007). It is going to be shown on Wednesday. 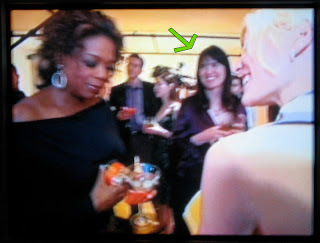 Our neighbors down the hall had a party that Oprah came to and was featured on that episode. 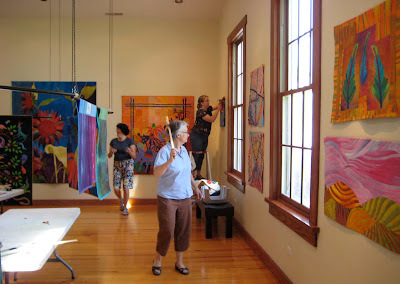 The second half of the show features the balcony renovations in the building facing her studios. Our unit has a tiny enclosed balcony so it was not part of that. But I was at the party, it was amazing, you can read about it here. The paper on the top left with letters is a kimwipe, the one on the right is a large black tea bag for making iced tea. The white paper below is a tea bag from hibiscus tea, the bottom two dark tea bags I left the tea dry in the bag for several days before tearing it open, I love how stained it became and kind of brittle. It really looks aged. I used a fine sharpie to draw on them. 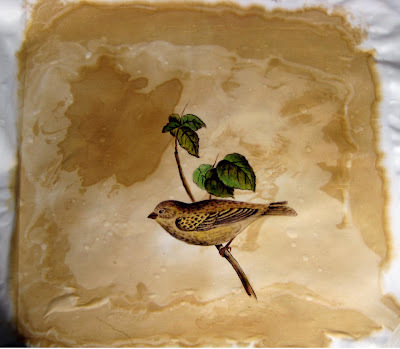 I painted a bird only using brown paint. After it was dry I glazed paint colors over the bird and leaves. I mixed a little brown in the colors to soften them, I wanted the painting to have a vintage look. 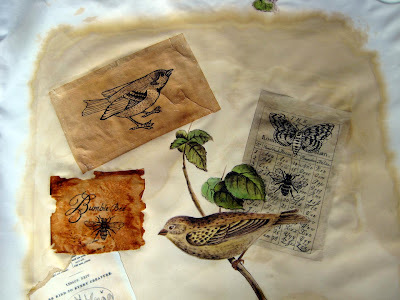 After the bird and twig was painted I mixed a diluted brown wash and painted the fabric with it. 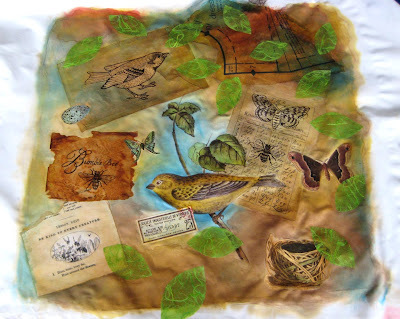 The papers are collaged to the fabric with Golden semi-gloss gel medium. Several of the other images are from decorative wrapping papers, and a scan I made of a page from a children's school book from the 1800's. Then I cut green rice paper leaves and collaged them to the fabric. I quilted it with wool batting. The areas not quilted are very puffy and look like trapunto. The dark tea bag with the bee really looks leathery and old. I am thrilled each time I see another Smart car on the road here in Chicago. I really think the American car companies need to take a look at these cool cars for some inspiration. One would hope the last 20+ years of monstrously over-sized gas guzzling vehicles are coming to an end. Gas is $4.49 in my neighborhood today and they say it is still going up until September. 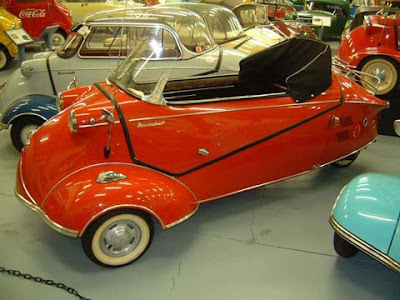 With options like some of these cute vehicles at the Micro Car Museum I bet more people would downsize. Wow what a great response! The class is now full. Thanks! These first brave souls are my guinea pigs. I will run the class again after this session ends. If you would like me to put your name on a list to be notified the next time around, send me an email and put Next Color Theory Class in the subject line. 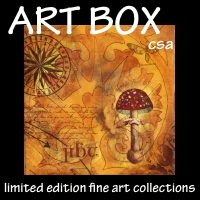 You can get a link to my email here. I will announce it on the blog too next time around. 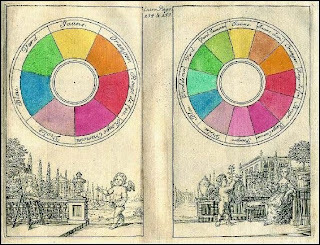 When I asked if people would be interested in taking a color theory workshop, several people showed interest and asked if I would do an online class. It's a six week course beginning June 23rd. Because it is the first class, I am running a special discounted trial limited to 10 people. Click here for more information, supply list and to sign up. Nine months of part time work gave birth to The Blackheart Gang’s acclaimed short film called, The Tale of How. The Tale of How is the second part of a trilogy of works called the Dodo Trilogy. It is to later be flanked by The Tale of Then and The Tale of When. The Dodo Trilogy, in turn, fits into a much greater work called, The Household.In the The Tale of How we meet a giant octopus with a tree growing in his head, the terror of the Indian ocean , OTTO THE MONSTER! His lonley past time is to devour the innocent dodo’s who lived on his head. We then see the dodo’s unite and with the help of a little white mouse, we saw them escape the clutches of the terrible be-tentacled tyrant and sail off into the sunset on their mother the tree.